Hold the saw foot firmly against the gourd surface during the cutting operation to minimize blade breakage. Do not turn the saw on until after the blade is inserted into the gourd. Cut slowly - never force the saw. This kit contain everything you need to cut gourds. The kit comes with two types of shoe attachments: The flat shoe attachment allows for more stability; the ball shoe attachment allows for more maneuverability when cutting the neck of the gourd or making intricate cuts and tight curves. The shoe can easily be changed by removing the screw on the bottom of the shoe. The jigsaw is ideal for cutting gourds. Cutting capacity: Wood up to 3/8", Non-ferrous metal 3/32" The unit is variable speed between 2,000-5,000 strokes/min. Included in the kit is a foot control switch allowing you to easily start and stop your jigsaw by simply pressing your foot on the switch. The 2 amp NG 2/S transformer is powerful enough to handle most of your gourd needs. Please email me to order the saw kits - they will be shipped to you direct from the distributor via UPS. KITS are available through Arizona Gourds - but individual parts are available from Amazon. Please use the links provided if you decide to order from Amazon. Purchases made through our Amazon links support the Gourd Art Enthusiasts and the Arizona Gourds websites. NOTE: Minicraft blades have been discontinued. Proxxon blades will also fit the Caning Shop saw and the Minicraft saw. This kit is almost identical to the saw shown above, but includes the heavy duty NG 5/E transformer, which provides the most power to cut through the thickest gourds. This kit also has a variable speed control and three outlets for additional 12v power tools. This kit does NOT include a carrying case. Use provided links above and below to order individual components from Amazon. 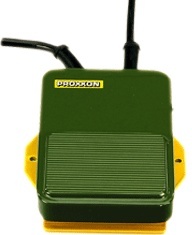 Want to upgrade your current Proxxon Saw system or replace an old transformer? NOTE: I do NOT recommend the Proxxon Rotary Tool for gourds. It is small and lightweight, but does not have enough power for gourd carving. Looking for a good carving tool that is easy on the hands and works well on gourds? 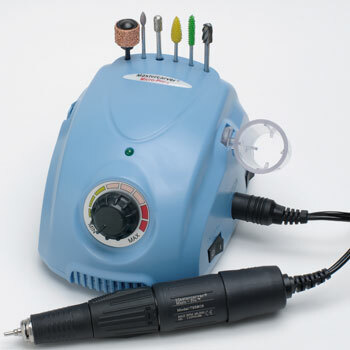 Check out the MicroCarver page for more information. Instead of the regular replacement blades, you can also use scroll saw blades in the Microlux mini jig saws (regular flat plate saw and the cross saw ball foot). The Olson 45000 saw blade is a high quality blade that works well as an alternative, and these saw blades will cost a fraction of the microlux blades. Simply clip the blades to the approriate length (approximately one inch, or you can even make them just a bit longer) with a pair of heavy wire cutters. Alternatively, cut them with a small stone cutoff wheel mounted in a Dremel tool - (these are the small stone discs that are found in almost every kit, and they are used in conjunction with a mandrel.) *Be sure to wear safety glasses when cutting the blades! You should get several mini blades from one scroll saw blade. *I have not found a good substitute for the larger blades used in other brands of saws - scroll saw blades are too thin for for use in the Proxxon, Minicraft and Caning Shop Gourd Saws. NOTE: I highly recommend the heavier duty transformer! This tool offers fantastic cutting capacity with a footplate that is adjustable up to 45 degrees for angled cutting. The housing head is made of die-cast aluminum, and has an electronic speed control for speeds from 2,000 to 4,500 RPM. This saw does NOT require a transformer, and because of this it weighs a bit more than the transformer models. There is no ball foot available for this model.